Embark on a journey to your Truest Self…Relax, align, and connect with Lauren Leduc and Lisa Lola on a holistic path in Paradise. Enjoy daily yoga, meditation, healing circles, and sacred ritual to dive deep into your body, heart, and Spirit. Find community among a tribe of women, collectively coming together to heal in a safe space of unity, allowance, and harmony. 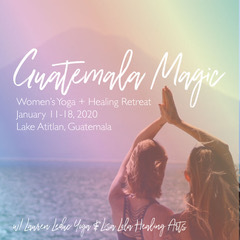 Connect to the homeland of the Indigenous Mayan natives on the majestic shores of Lake Atitlan, Guatemala, referred to as the belly button of the Earth ~ at the center of the Universe. The vortex of high frequency energy on this land takes one’s experience beyond the known. Magic happens and healing occurs. In this magnificent retreat, we play with the 5 elements of Earth, Water, Fire, Air, and Ether. Engaging our senses to remember our essence and truth. In exploration of your connection to Spirit, local Shamanic Healers will facilitate a Sacred Fire Ceremony and Cacao Ceremony to open the heart and invite in love. Immersed in this weeklong vibration, women leave this retreat feeling a renewed aliveness, a deeper presence, and a knowing of themselves connected to all of creation. In addition to plenty of time spent relaxing by the lake or pool, in a hammock or the hot tub, enjoy a vast array of healing spa services and 3 organic nourishing meals a day. Lauren Leduc, RYT500, Owner and Founder of Karma Tribe Yoga and Co-Owner of Heartland Yoga Festival. Lauren is a dedicated yoga teacher and entrepreneur with the unique gift of cultivating connection and community. She believes that yoga is beneficial to everyone and is passionate about creating accessible experiences and opportunities for students to find a deeper connection to themselves and the world around them. 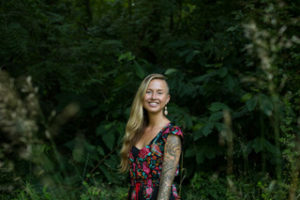 Lauren thrives on creating opportunities to learn, grow, and connect, including workshops, international yoga retreats, Karma Tribe Yoga 200 hr Yoga Teacher Training and Mentorship program and is also a certified Thai Yoga Bodywork practitioner. This is Lauren’s 3rd year leading an annual women’s retreat at Villa Sumaya with Lisa Lola. Lisa Lola, Energy Healer and Owner of Lisa Lola Healing Arts. Lisa has made her life devoted to healing. She loves energy medicine and believes in its ability to heal the planet. She offers services of healing to assist others in healing themselves. As a practitioner of Energy Medicine, Lisa’s emphasis in the healing arts focuses on Chakra Balancing, Reiki, Somatic Energy Processing, and Channeling to work with one’s energy field to bring unity, balance and well-being to her clients. Lisa loves bringing a collective of like-hearted souls together in workshops, international retreats, and as a guided meditation instructor at Karma Tribe Yoga. This is Lisa’s 3rd year leading an annual women’s retreat at Villa Sumaya with Lauren Leduc.